"The less experienced devotee and collector of ‘Recorded Vocal Art’, on first hearing the voice of Herbert Ernst Groh will invariably say '... that's Richard Tauber'. And certainly Groh does share with his illustrious fellow artist a very similar timbre. Tauber was Groh’s senior by 14 years and his influence on the vocalisation and delivery of German speaking tenors in the following generation was particularly strong, especially so in operetta. One hears echoes of Tauber in recordings made by Marcel Wittrisch, Leonardo Aramesco, Hans Heinz Bollmann, Karl Friedrich, Hugo Meyer-Welfing to name but a few. However an added factor in this case is that Tauber underwent his first serious vocal studies with Professor Karl Beines, and for a while so did Groh. Beines was a noted pedagogue, developing in his pupils a high degree of musicality, sense of style, and above all panache. However he also promulgated what is considered by some commentators to be a questionable method of voice placement when applied to the production of top notes. This no doubt explains how it is that Tauber and Groh sound so very much alike in the technical approach to their singing. Herbert Ernst Groh's voice attracted attention at an early age and he is reported to have given public concerts as an alto at the age of 13. In his late teens he undertook study in Zürich, Munich and Milan. His theatrical début was at the Darmstadt State Theatre in 1926 where he remained until 1928. Groh specialised in operetta from the outset and in 1929 commenced a career dominated by broadcasting and recording rather than on the stage. Throughout the 1930's his voice was heard regularly on all the principal radio stations in Germany. The wide distribution of his recordings, (mainly on the Parlophon label), and appearances in a number of films assured for him an international cachet. Late in 1945, after the Second World War, he rekindled an earlier association with the distinguished composer Robert Stolz and made numerous European concert tours singing operetta melodies. In 1955 Groh married the soprano Friedel Blasius and together they sang in a number of colourful productions. They toured the United States as late as 1968 and had a great success in MY FAIR LADY. Groh's voice, although not quite as large as Tauber’s, possessed an upper extension that nature had seemingly placed a tone higher. We hear how easily he moves through the passaggio (the bridge tones between the chest and head registers) without any unnecessary forcing. Put under pressure, however, the naturally attractive timbre of his fundamentally lyric voice becomes somewhat laryngeal in quality - what in German is referred to as a Kravatten Tenor (one whose neck-tie is a little too tight), or one who sings with a Knoedel (dumpling) in his throat. This technique most obviously and most frequently precludes the penetrating and dramatic Squillo (ringing tone) that can physically thrill, and is so admired in the technique of Latin trained tenors. 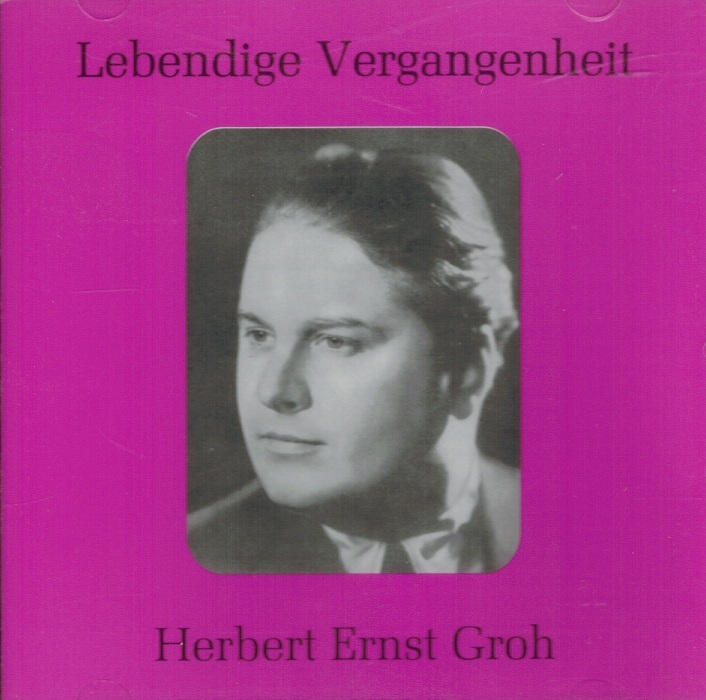 Herbert Ernst Groh compensates by offering a rich display of other vocal qualities: an extremely warm middle register, a truly excellent mezza-voce, well controlled tones above the stave, an ability to produce a morendo for dynamic effect and beautifully floated falsetto high notes. Added to all this is a highly refined approach to phrasing, and an élan mirroring that of his role model, Tauber, making for a quite irresistible performing style. There are other roughly contemporary singers who, like Groh, had limited theatrical careers, and whose reputations are based on their numerous recordings: the Italian tenor Alessandro Valente (1890-1958), the Greek tenor Costa Milona (1897-1949) and the ill-fated Joseph Schmidt (1904-1942). Groh, like Schmidt, became active in opera performances on the radio, frequently appeared as a popular concert artist, and starred in several movies. Early in his career Groh recorded operetta arias for HMV, and in Italy, duets with Pia Rossi (nome du chante of the famous Pia Tassinari) which are extremely difficult to find. Extensive sessions followed for Odeon, Parlophon, Telefunken, Decca and Ariola. Groh was still cutting discs into the early LP era for Urania. 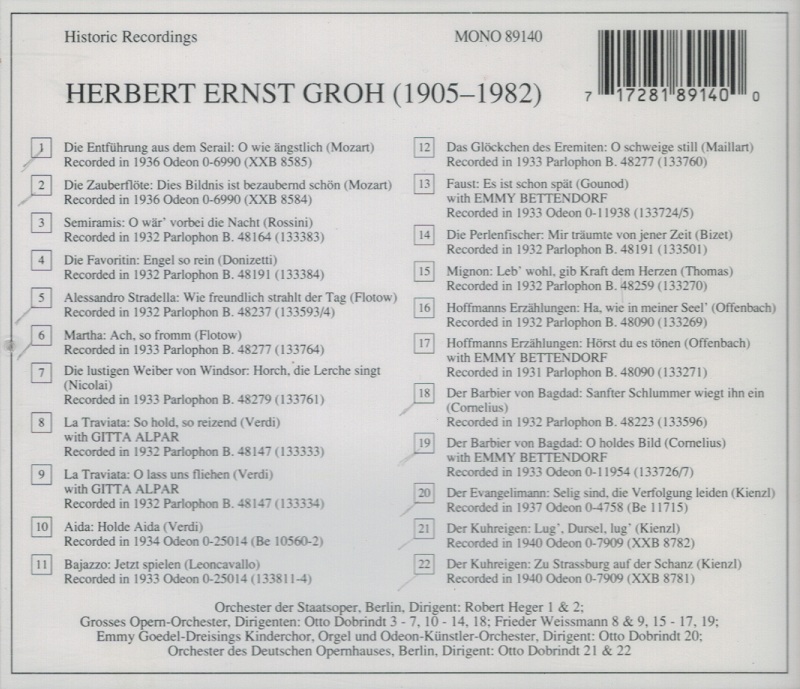 In total, Groh left for his many admirers and vocal collectors a huge recorded legacy of well over 600 discs. The repertoire ranges from operatic arias and duets with other distinguished contemporary recording artists, to numerous popular songs and well-known Italian and Neapolitan canzone - mostly sung in German. Several solo and concerted opera and operetta excerpts were issued, mainly on the Parlophon label, and a number of these are featured in this CD compilation. His recordings illustrate all facets of his art and there are several instances where his choice of operatic material is unusual, and therefore not only vocally, but also musically very interesting. 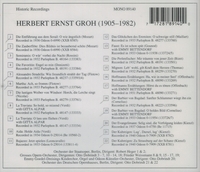 As with the recordings of Richard Tauber it is self-evident that Groh’s contribution in the field of German operetta and popular ballads is immeasurable. He exudes something that goes beyond the possession of a good voice, and which with few exceptions is sadly missing today - a truly fascinating musical and immediately recognisable vocal personality. Capitalising on his universal popularity Parlophon issued a number of operatic arias (all sung in German), that Groh would never have attempted in the theatre. Nonetheless in his singing of the most popular arias and duets associated with [heavy] rôles he demonstrates mastery of legato, cantilena, excellent phrasing and an unaffected style that was perfectly suited to his preferred medium of recording and broadcasting. His musicality, control of dynamics and phrasing in both Mozart arias is exemplary, placing his efforts among the best on record. Nadir’s romance from LES PÊCHEURS DE PERLES is sung in the original key of a minor in a well-controlled mezza-voce, during which he executes several soft and beautifully poised high B naturals, and pays his respects to the composer’s intentions by eschewing the unwritten (but often interpolated) high C at the end. Wilhelm Meister’s ‘Leb wohl Mignon’ from Thomas’ opera is not over sentimentalised and is again a model of refinement. His stylish singing of ‘Ah, dove il cimento’ from Rossini’s SEMIRAMIDE (sung in German as ‘O wer’ vorbei die Nacht’) appears to be unique in that there was no other recording of the piece made in the 78 rpm era. Likewise his version of the lovely and melodic aria ‘Jungfrau Maria’ from Flotow’s ALESSANDRO STRADELLA, which contains a section of the opening recitative and a demanding final cabaletta usually omitted even by distinguished tenors His lively three-verse version of the ‘Postillion Lied’ from Adam’s opera LE POSTILLION DE LONGJUMEAU is full of vocal frisson and he emits the sensational top D natural in a sustained and very effective falsetto. And as one expects from such a stylish singer, Groh manages to sustain a fine legato in Richard Strauss’ cruel musical joke ‘Di rigor amato’ from Act l of DER ROSENKAVALIER, negotiating the fiendishly high and demanding tessitura and repeated high B flats and the high B natural with consummate ease."